You'll be £6.40 closer to your next £10.00 credit when you purchase Challenger 2. What's this? For much of the Cold War, the British Armys main battle tanks (MBT) were first the Centurion and then the Chieftain. The question of the latters replacement became urgent when in 1980 MBT80 was cancelled. While the Royal Ordnance Challenger (originally the Shir 2) was acquired as a stop gap its design and capability limitations quickly became apparent. Vickers then took over the Royal Ordnance tank building facility and against stiff foreign competition developed the Challenger 2. 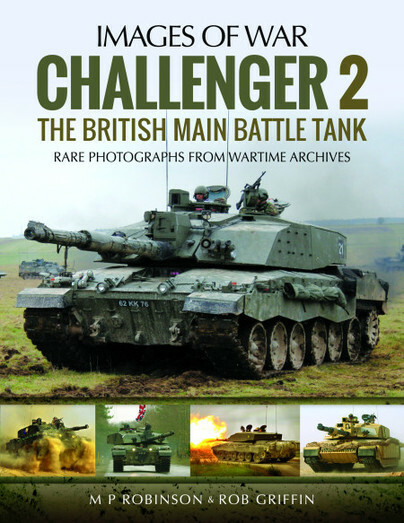 This superbly researched and illustrated book tells the story of the evolution and subsequent successful career of Challenger 2 which has seen distinguished service in war and peace since 1990 and has proved itself one of the worlds most formidable fighting vehicles. The authors do not shy away from technical detail and make comparisons with competitors. The result is an objective and authoritative work which will delight military equipment buffs, modellers and wargamers. A superb addition to the Images of War series. Unlike the previous IOW titles, this one contains full colour images, with some stunning examples amongst the many packed in to the 160 pages. Rob Griffin is well known to British post-war armour enthusiasts, having written many books on British tanks over the years, and this new title certainly maintains the reputation for excellence. As books on the Challenger 2 go this is up with the best. As ever with Images of War books, the heart of it comes in the collection of photos which provide a great spread of coverage of the Challenger 2 in service. They include it from the early prototypes through to the latest configuration including the new Mobile Camouflage System (MCS). Robert Griffin joined the British Army in 1967 as a 17 year old Junior Leader and served for many years as an AFV crewman in the 4/7th Royal Dragoon Guards in BAOR, BATUS, Cyprus, Northern Ireland, the UK and Bosnia. A recognised expert on post war British armour, he has written a number of books and articles on armoured vehicles of the Cold War period, including definitive works on the FV-214 Conqueror, Chieftain, Challenger 1 and FV432. MP Robinson is a Canadian military historian whose research is focused on Cold War era armoured and mechanized warfare. He has co-authored (with Rob Griffin) two previous titles for Pen and Sword Military; Challenger 2- The British Main Battle Tank and The Royal Armoured Corps in the Cold War.